Brunner Building #2 | Historic Jacksonville, Inc. 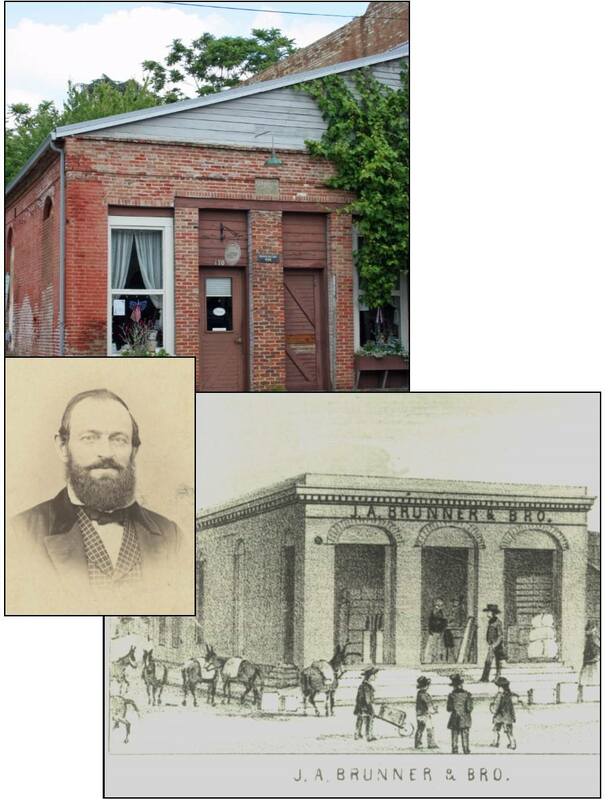 Constructed around 1855, the Brunner Building at 170 S. Oregon Street was the second brick building erected in Jacksonville and remains the town’s and Oregon’s oldest brick building still standing. Jacob Brunner was an early arrival to the young gold mining camp and by 1854 had established himself as a merchant carrying one of the heaviest stock of goods. A year earlier, Brunner had purchased the Main and Oregon corner lot at the new settlement’s first commercial street intersection. By January 1856 he was advertising his “fire-proof brick” store. An 1860 rear addition made it not only the “largest store building in Jackson County” but also “the largest south of Salem.” Brunner was among the first elected Trustees of Jacksonville after the town government was organized in 1860. However, by 1863 he had sold the “Brunner Building.” Belatedly catching “gold fever,” he appears to have moved on to the mines of southern Idaho.